State air-quality regulators told local officials and about 50 members of the public Tuesday that the Fairbanks North Star Borough soon will have to impose a new set of tough measures to dramatically reduce fine particulates and other air pollutants in the Fairbanks area. The new measures will affect just about everyone in the area – not just those who burn wood for heat. State regulators, foreground, and local officials take their seats before Tuesday’s meeting. 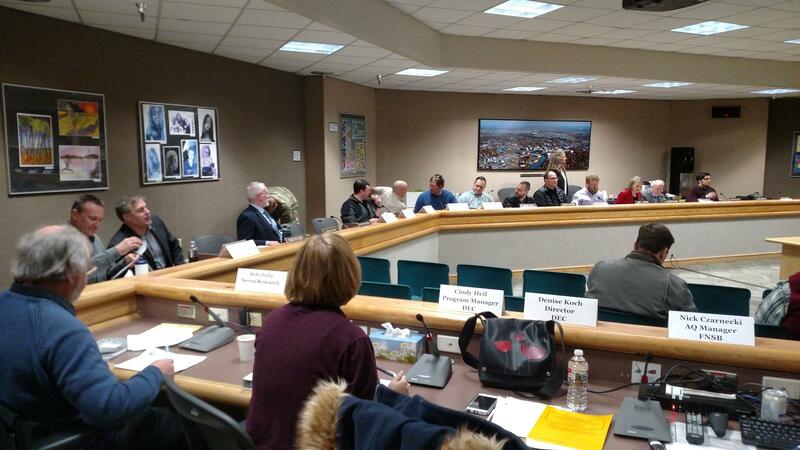 The borough mayor, Assembly members and staff were joined on the Assembly meeting chamber dais by the post and base commanders of Fort Wainwright and Eielson Air Force Base and members of the North Pole and Fairbanks City Councils, along with members of the borough Air Pollution Control Commission. The regulators with the state Department of Environmental Conservation’s Air Quality Division delivered a sobering message in Tuesday’s meeting at the borough Assembly’s chambers. “Unfortunately, to some extent, we’re not here as the bearer of good news tonight,” Air Quality Division Director Denise Koch said. Borough Air Quality Manager Nick Czarnecki and DEC Air Quality Division Director Denise Koch at a Feb. 28 meeting in Fairbanks. Both also were on a panel of air-quality experts that presented information in Tuesday's meeting about proposed measures to clean up the Fairbanks area's air pollution. 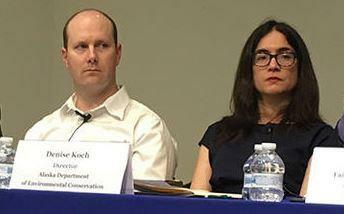 Koch says the panel of agency air-quality experts requested the meeting to explain a set of documents they’d produced that lay out the measures needed to reduce the area’s air pollution so that it won’t harm human health and will bring the borough back into compliance with federal air-quality standards. 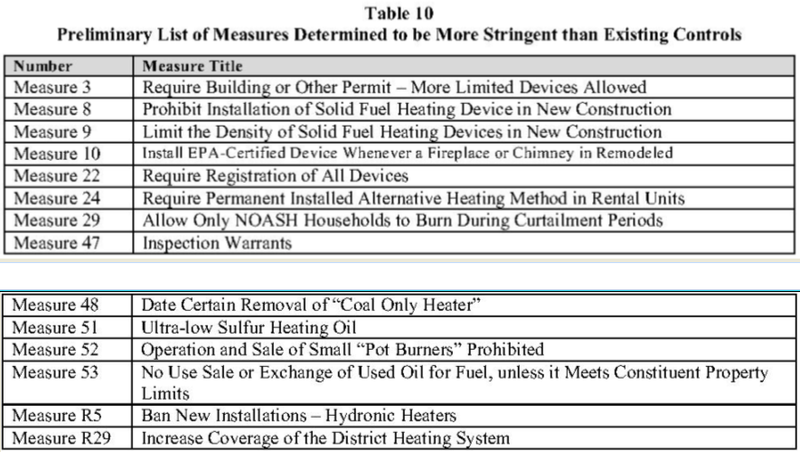 The panelists focused much of their presentation on 14 proposed measures that are more stringent than the borough’s existing efforts to reduce fine particulates, or PM2.5, which have mainly focused on homes with woodstoves. They said federal law requires more-stringent measures because the borough had failed to reduce PM2.5 around Fairbanks and North Pole sufficiently to attain federal air-quality standards. DEC air-quality staff and consultant narrowed a list of 71 proposals to clean up the Fairbanks' area's air pollution to 14 measures that will be considered for the final State Implementation Plan the staff hopes to submit to EPA by the end of the year. So, the Environmental Protection Agency last year redesignated it a serious non-attainment area, and required the state to develop a plan that includes such measures as mandatory use of ultralow-sulfur heating oil, or ULSD. Heil says DEC estimates ultralow-sulfur heating oil would cost 34 to 43 cents a gallon more than No. 1 and No. 2 heating oil. But ULSD greatly reduces sulfur emissions, says Bob Dulla, who was contracted by DEC for the analysis. Dulla says number-one fuel oil emits about 850 parts per million of sulfur when burned. That’s more than 50 times the 15 parts per million that burning ULSD produces. “It’s a very, very significant reduction, and provides a very real benefit,” he said. The DEC Air Quality Division staff also is considering a measure to reduce sulfur dioxide emissions from five Fairbanks-area powerplants. A preliminary Best Available Control Technology analysis conducted by the staff includes recommendations on the types and cost of proposed air-pollution reduction measures. The "community burden" of the measures totals more than $53.7 million. Heil says the State Implementation Plan that DEC is compiling also will likely require reducing emissions of sulfur dioxide, because the chemical compound can combine with other substances in the atmosphere and form PM2.5. So, she says, DEC proposes to require owners of so-called point sources of emissions, mainly powerplants, to install a total of $54 million worth of additional pollution-control technology to remove most of their sulfur-dioxide emissions. Heil and the others emphasized that they’ve tried to balance the costs of the measures they’re proposing in the State Implementation Plan against the benefits. But she and the other panelists warned there’s no guarantee that EPA won’t require more stringent measures that for example could include the more efficient powerplant-emissions control technologies. On the other hand, as Dulla said, they’re all aware that at some point, at least some residents may decide they can’t afford to pay the cost of cleaner air. Assemblyman Van Lawrence came back to that issue during a question-and-answer period after the panelists spoke, and suggested the state plan should account for those possible tradeoffs. “We also have to figure out how much PM2.5 is being generated by that increase in wood-burning, as compared to how much is being saved by decreasing the amount of sulfur in the air,” Lawrence said. Other Assembly members and officials at the meeting raised other concerns, such as how higher fuel-oil prices will affect the Interior Gas Utility’s efforts to encourage conversion to natural gas. By the end of the meeting, most appeared ready to get to work on ordinances that would implement DEC’s proposed measures. Borough Mayor Karl Kassel says he’ll begin by immediately forming a stakeholders group to include residents and representatives of businesses that would be affected by the new regs, such as Golden Valley Electric Association. Koch, the Air Quality Division director, says she and the other panelists will meet today with some of those stakeholders, including Golden Valley. Local, state and military officials will meet jointly tonight to talk about a new series of federally mandated air-pollution control measures that will be established in the near future around the Fairbanks area. State air-quality regulators are inviting people who live in and around the borough’s air-pollution-plagued Nonattainment Area to take a look at a series of draft documents that outline the problem and proposed solutions. A local air-quality advocate says it’s important residents read the documents, to understand more about what’s being proposed to help clean up the area’s air -- and to participate in finding solutions to the problem. The Fairbanks North Star Borough Assembly on Thursday rejected an ordinance that would have added a type of air-pollution control device called electrostatic precipitators to the borough Air Quality program. But the sponsor and main supporter of the measure was OK with that. The Fairbanks North Star Borough Assembly approved a resolution Thursday that supports and authorizes testing of a type of air-pollution control technology that local advocates say will clean smoke from woodstoves and help improve the area’s air quality. The advocates say they hope the data they’ll develop through their testing will convince federal environmental regulators to include electrostatic precipitators on its list of EPA-approved technologies that could enable homeowners and businesses to continue operating their wood- or pellet stoves during burn bans. The Fairbanks North Star Borough Assembly approved an ordinance Thursday that’s intended to enable more area residents to qualify for a borough program that helps them pay to replace their older woodstove or other type of solid-fuel-burning heating appliance for a new cleaner-burning unit. The Fairbanks North Star Borough Air Pollution Control Commission decided Tuesday it can’t support an ordinance proposed by Assemblyman Lance Roberts that would promote use of a device that proponents say could offer a lower-cost means of reducing particulate emissions from woodstoves and other solid-fuel heating devices. Fairbanks, AK - The Fairbanks North Star Borough Assembly agreed to put $150 thousand dollars in federal funding toward the completion of a state implementation plan, or SIP, for air quality control.